“Deo Gratias” / “I Give Thanks“, a limited edition serigraph hand-printed by A.Vonn Hartung, was inspired by the legend of Cristo Gate where in 1753 a miracle is said to have occurred on the feast of St. John the Baptist, the patron saint of San Juan, Puerto Rico. As was customary the local boys would assemble to race their horses. During the course of the day one boy, Baltazar Montañez, was unable to control his horse which plummeted over the cliff onto the rocks below. Upon witnessing this, Don Mateo Pratts (the Spanish Secretary of Government) was said to have risen and pleaded aloud, “Christ of Good Health, save him!” The horse died. The boy lived. Don Mateo vowed to build a chapel near the spot and dedicate it to the Savior. It stands to this day at the end of Cristo Street in Old San Juan. The work is a tribute to the power of faith which, it is told, saved the boy’s life. 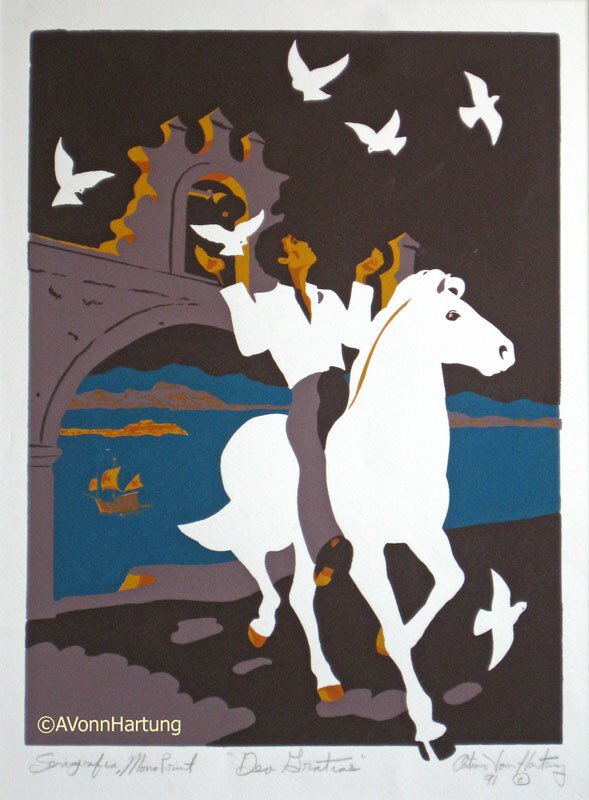 This serigraph is also a tribute to the horse, the great gift brought to the New World by the Spaniards. Depicted here is the Andalusian Horse with its typical diagonal gait. 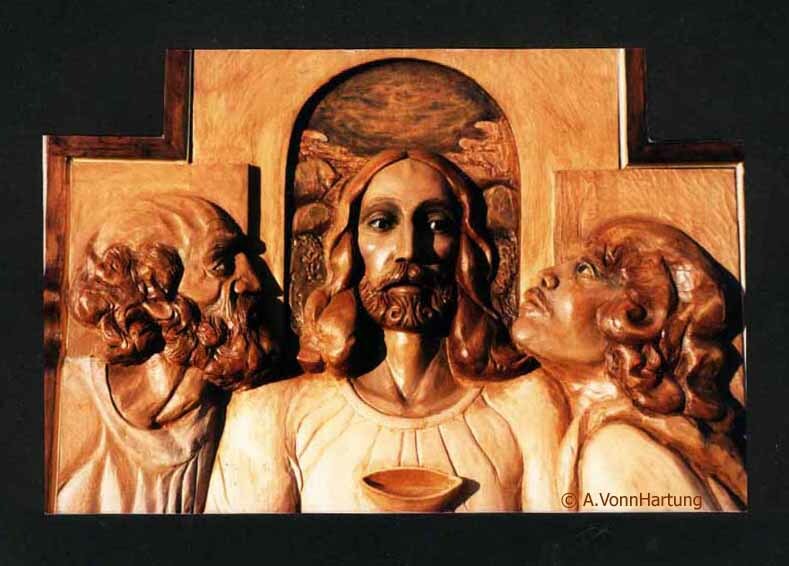 “Deo Gratias” / “Doy Gracias“, una serigrafía de edición limitada impreso a mano por A.Vonn Hartung, se inspiró en la leyenda del Portón de Cristo, donde en 1753, en el día de San Juan Bautista, patrón de San Juan, Puerto Rico, se dice que ocurrió un milagro. Los jóvenes del pueblo acostumbraron tener carreras de caballo. Un día el joven jinete Baltazar Montañez no pudo controlar su caballo y se precipitó por el despeñadero al extremo sur de la Calle Cristo. Se dice que un testigo, Don Mateo Pratts (el Secretario de Gobierno de España) al ver lo sucedido dijo: “¡Cristo de la Salud, sálvalo!” El caballo murió. El joven sobrevivió. Don Mateo prometió construir una capilla cerca del lugar del suceso y dedicarla al Salvador. Hoy en día la vemos al final de la Calle Cristo en el Viejo San Juan. La obra es un homenaje al poder de la fe que, según se dijo, salvó la vida del niño. Es también un tributo al caballo, el gran regalo que los españoles le dieron al Nuevo Mundo. Representado aquí es el caballo Andaluz con su típico paso diagonal. Published 20 August, 2014 at 589 × 800 in Serigraphs.